Clicking on this image (the Clausewitz.com logo, in various sizes) anywhere on this website will usually return you to the main welcome page. 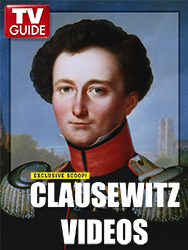 The Clausewitz Homepage contains over thousands of text, image, and video files. Use the NavBar at top or, if you know exactly what you're looking for, you can do an on-line Search. Otherwise, the easiest and most informative way to navigate the site is to read the Frequently Asked Questions (FAQs): Our short answers include links to the most relevant materials. There are also links to a number of particularly important subordinate pages at the bottom of our Welcome page. 2. What did he do to get so famous? 3. Why are people still so interested in his ideas today? 4. Why are Clausewitz's ideas so controversial? 5. What ARE Clausewitz's ideas? 8. How do I teach Clausewitz to my students? 9. How do I learn more about Clausewitz and his ideas, the ways he has been used or interpreted, the controversies about him, or his relevance today? Support Clausewitz.com by using the Amazon/Clausewitz.com connection! Please feel free to refer or link to any materials on this site, and of course printing is authorized for personal use. However, unauthorized duplication of these materials in print or on-line without explicit written permission from Clausewitz.com or, where applicable, from the copyright owners of materials posted here with their permission, is prohibited.